Eastern Rivenspire, northeast of Hoarfrost Downs. 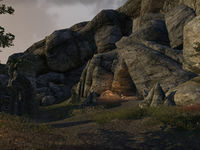 The Cave of Sorrows is a cave in eastern Rivenspire, just northeast of Hoarfrost Downs. 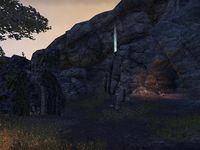 The Daedric writing on the shrine inside the cave says "LOVE THE GAUNTLET", and the writing on the altars reads "TASK MASTER", possibly referring to Peryite.